This Info Will Go Down Well! Key Largo scuba clubs and diving centres are extremely popular places to visit. And really that is no surprise, because as soon as you start learning how to dive and taking lessons people will have mentioned Key Largo to you as a place to go. Well the whole place is known as the Diving Capital of the World, and with natural and artificial reefs, lovely weather, great wildlife and even wrecks and sunken treasure (yeah I’m not kidding you) it has the lot. You will find Key Largo scuba and diving experiences second to none. On this page we will provide you the low down of the best dive sites to be found in the area. The best (or at least most recommended by the diving and scuba fraternity) dive centres to try out. And links to costing’s, equipment hire, and heck, anything that we can think of to make sure your Key Largo scuba adventures are everything that you would want. 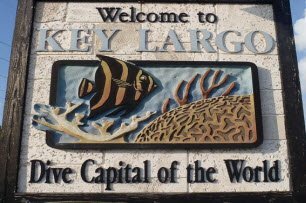 So lets start….or even better lets dive in to the best of Key largo Scuba information by simply letting you know where you have to travel to in case you are unsure. The islands of Key Largo are part of the Florida Keys, which are string of islands at the very tip of the mainland of America. Key Largo, as you can see from the map below is right at the very top of these islands, so if you were traveling into any of the main airports that service this part of the states, you would be looking to enter at either Miami International, or Ft Lauderdale as the main two choices. Miami International Airport is about 40 miles or so. Even Orlando is only a drive of about 4 hours, so it doesn't take too long at all. 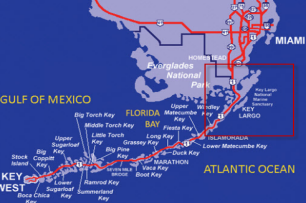 The whole of Key Largo is only the length of 33 miles (53 km), but is still the longest of the group of islands that make up the Florida Keys. You will definitely be directed to John Pennekamp National Park, if you are at all interested in diving around the waters of Key largo. The park was the first underwater national state park in the whole of America when it opened in 1960, due to it being the custodian of the only living coral barrier reef to be found in the whole of America, and consists of 70 nautical square miles of Atlantic Ocean waters. 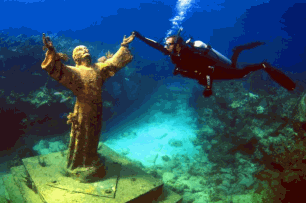 It is a great place to dive if not only for the photo opportunity of touching the Christ of the abyss, which is a statue sunk to the bottom of the ocean, and is truly the iconic image of Key Largo scuba and dive sites. It stands 81⁄2-foot-tall (2.6 m) statue of Jesus Christ and weighs 4,000 pounds, so in it's water depths of around 25 meters it’s not going anywhere. You won’t want to miss out on doing this if you are at all interested in diving. Another of the great Key largo scuba and dive sites is the artificial reef which was formed by the sinking of the USS Spiegel Grove back in. Although as we said Key Largo has the bulk of the coral reefs around the Florida Keys, a few times they have deliberately sunk naval frigates to encourage the spreading of the reefs. Although good news for the underwater marine life, it is also great news for the divers of the world, and give you more places to explore. The list below is just some of the Key Largo scuba and dive sites in the area, so click through for more detailed information on each where you see the link. We will be adding detailed information on each as soon as possible so check back often or subscribe to our RSS feed, and receive updates straight to your email account. It's not surprising when you have the name of the "Diving Capital Of The World", but you are spoilt for choice when it comes to Key Largo Scuba and Diving Centers. From the moment you start on your journey down the Overseas Highway or US1 as its otherwise known you will see red flags like the one below, that indicates the position of the dive shops and centers. It becomes a bit of a game with the kids, trying to spot the next one coming up. You will really be spoilt for choice as all of them are well established, have good day rates, and provide a great level of service, making sure that you get taken to the Key Largo scuba and dive site to match your experience. They of course will have the expertise to check your equipment is fully functional and safe for your and your family to have an amazing time underneath the Key Largo waves.